Fight Censorship, Not Holiday Crowds – Support the CBLDF’s Spirit of Giving! Celebrate The Spirit of Giving this holiday season by getting once-in-a-lifetime presents for the fans in your life in support of the Comic Book Legal Defense Fund! When you do, The Will & Ann Eisner Family Foundation will make a contribution to the CBLDF for every donation and membership placed during this campaign! CBLDF is offering the best presents in comics, including graphic novels personalized to the fan in your life by icons including Neil Gaiman, Art Spiegelman, Frank Miller, Dan Clowes, Robert Kirkman, Dave Gibbons, and many more. 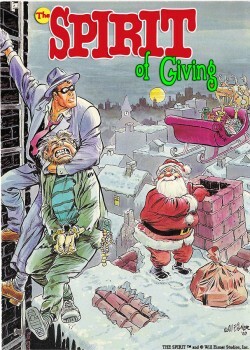 Plus you’ll get an exclusive Will Eisner gift card that tells them your gift helped do good for comics! When you support the CBLDF’s Spirit of Giving drive between now and December 16, the Will and Ann Eisner Family Foundation will make a contribution of $1 for every donation and gift order placed on the CBLDF’s website. In addition, they will contribute $5 for each new, renewing or gift membership made from now until December 31!